It reminds me the pleasure when I read this famous book about “art of war”, according to Chinese philosophy, from Sun Tzu. This masterpiece became as famous as strategic gentles like Porter, Christensen, Chan/Mauborgne and so long, in the art of NOT making war in any case. I as thinking about some quotes and some parts remind me, as I’m surfing along, in the digital cage. Yes like Tzu said, we have to spend some time to discover and share anything, on social networks, while there is any trust, in the fact that we often know our “friends”, only in virtual life. I know now, virtual life online is supplying more and more details about “friends” (sometimes too much I guess…), and I can think, there is still privacy. I selected some quotes, that, in my opinion, show some unrevealed faces of social web. “war is a skill: no engage without all the reflexion that it needs”: guess everybody wants to make some noise, lot of noise, and make lots of friends on web (and/or life). But what for? give an idea of which goal you score, what aim you follow will make you more accurate and relevant in your expressions and sharing. “…army will be close and team builded, happy for one goal…”: social networks and communities, can give opinion and pressure to lots of modern topics, peacefully of course…aimed in the same direction. “bulk forget about death”: let’s see beyond first sight, to get the essence…death could mean “meaningless, excluded, apart” ; while networking and blogging, nobody cares about being apart, when rules and rites are clearly respected. Nobody wants to exclude no one. “the general must create situations that lead to achievement”: when one launch a discussion or debate, that leads to result and building a collective enhancement. 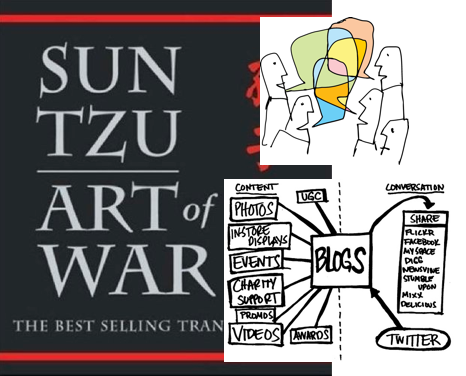 “the masters in art of war, will lead without fight…and win”: know how lead a debate, without any opposition, leveraging each collaboration and answering to words sharing, that means wise behavior. “know enemy and know you too”: guides you to a strong vision in your strengths and weaknesses, works for debate, identify your abilities and know how to withdraw. “what depends on me, I can do it”: answer, send congratulations, thank people…all kind of shapes of participating and animation of debates and communities. “in art of war, there is no fixed rules. They can change, adapting to context…”: be flexible, but be kind and drive the discussion. No obvious idea, no prejudgment, feel free to be brought wherever you’ve maybe never been. It’s a principle of “bring and pick”, the essence of conversation. “so, we just need few force to make lots of result ; like a rolling stone in a steep slope”: social media is viral, and there so much leverage in using it carefully. I was really happy to read and consult this book of good sense and harmony quest, by the old gestures of wisdom. Guess, if you’re patient enough, there’s a lot of wisdom to care and get in socializing web and media. That’s why we need each other to complete our facing challenges and interrogations. Gear up collaboration, collaborative rooms and friendness, and let’s use the web as it is: a big disruptive tool reducing the fence, recovering harmony in relations. I was scared about French claims about web, according to new idea of taxation of…Google (or whatever search it could be). I ‘m wondering why, each time a company, a man, an idea makes money, it’s unbelievable to see what kind of jealousy it draws, and in the same time, seeing lack of innovation running…but criticize, steale or law sues. It seems like everybody is jealous about his neighbour, ready to kill to spread on his wealth. I can’t see any reason why old skills or traditional sectors, have to complain about web, that gives us so much freedom, reduced social fracture, gave access to information all over the world and so much more. Complains from creators, authors and editors, that always search to build walls to protect their business (with sometimes and local politics agreements…), while there is so much opportunities, when they only see threats…What a pity, a lack of imagination (remember lack of imagination was the FIRST reason why the 11th of september terrorism’s attack has been possible…imagination), when imagination can make all the walls disappear, send us back hope, ideas and innovation. Does business only consist to copy, be jealous or sue competitors? Is this the only level of motivation right now? I can’t see why music, newspapers, books, all these traditional markets, complain about the web: they didn’t while they were referenced and googled so many times, rising their notoriety for free…They didn’t while that boosted some unknow artist like never, for free. They didn’t while their “pagerank” and fame indicator was green. But now they deny the one that put them at their level. Why? Because they lack imagination, the constant key able to think of future, tomorrow, and invent their future business. They want cash for free. But they don’t want freeness. They want service for free, but want to be payed for their notoriety…that costed nothing for them. I like Chris Anderson’s point of view, not why he wrote a book, but because his vision lives with the market: he’s clever about what’s going on, and probably what could exist tomorrow. And many of companies don’t even try to understand how disruptive they can be in the future, because they are followers, and just hope to make a good M&A with their competitor.